Recent work from Faversham and Oare Creeks and surrounding areas. The paintings in the exhibition came about as the result of walking the path which links the creeks of Faversham and Oare and also the marshes beyond. Lots of walking, exploring, photographing and sketching play a part in my work but ultimately all the pieces here were begun on site and then finished in the studio. The Creek at Faversham is a navigable, saltwater tidal channel, running south from the mouth of the Swale into the heart of the town. 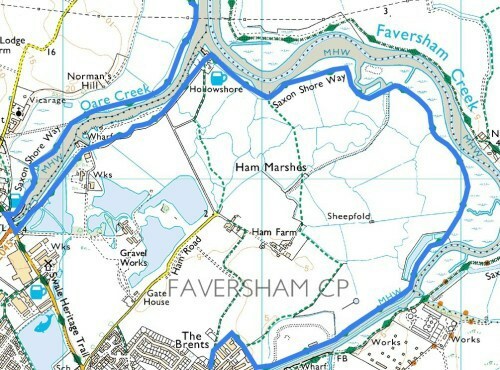 It meanders between the saltmarsh grazing pasture of Ham and Nagden marsh all the way to its northern point at Hollowshore where it merges with Oare creek and joins the Swale estuary. These twin creeks border and enclose an increasingly rare environment in terms of native flora and fauna. Though it still bears traces the area is silent now to its industrial past, a time when grain, fruit, hops and then gunpowder were ferried on sailing barges to the capital. This inter-tidal zone is the haunt now of migrating and overwintering wetland birds and many native species. Pylons stride the horizon overseeing the walkers, twitchers, boats and grazing cattle and sheep. This is not a wild landscape - it is managed, curated and preserved to protect its unique diversity - but it does retain a sense of isolation, a hinterland between us and the sea. Here you can find hogs fennel, sea purslane, golden samphire, sea lavender, ragged robin, reed and teasel. Freshwater dykes, scrapes, sluices, fleets and medieval sea walls show our husbandry of this habitat. Part of the Saxon Shore Way, the route linking the original Roman fortifications around the Kent coastline, this path through the marshes is a great way to experience part of Kent’s natural and historical heritage. 'From Creek to Coast' exhibited at the Fleur de Lis Gallery and Heritage Centre in Faversham throughout September 2013, originally only for the month it was extended by 2 weeks into October. We were pleased with the response the exhibition received; so much positive feedback. It was a pleasure to meet many people in the gallery when we sat in on a Sunday. A chance meeting on one of these mornings lead to an invite for Paul to exhibit in 'Tides of Change' on LV21 during Kent's Coastal Week 2013 and to be involved with Medway Swale Estuary Partnership's magazine Mudlark, (more about these later). The exhibition was a great success, more than we could have hoped - which was very encouraging. Thanks to everyone for all of the support, it was most appreciated. Paul will return to the Fleur de Lis Gallery in November 2015. Please check the Diary ..
..to receive news and updates. Please check your email and confirm your subscription to the mailing list. Window exhibition following on from the Fishslab. An Exhibition of recent work..
Group exhibition by Kent Artists. Open exhibition - theme - Gold.